1. Remove from package and rinse in running water. 2. Add to a pot and cover with cold water. 3. 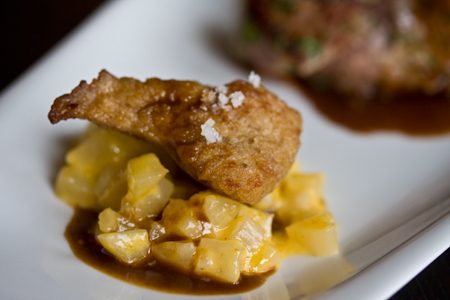 Add a tablespoon of salt for each pound of sweetbreads. Bring water up to simmer. 4. As soon as it hits a simmer, turn the heat off. Let sit in water for 15 minutes. 5. Remove from water. Pat dry. 6. Wrap in saran wrap or towels. Weigh down. Ideally put between 2 sheet pans and put a couple of cans on top. Place in fridge overnight. 7. The membrane of the sweetbreads is slightly tough, and must be peeled. Peel the membrane like you would peel a roasted pepper. 8. Sear in high-temp oil over medium-heat until browned. Turn down the heat, empty the oil. Add butter. Baste the sweet breads in butter for about 5 minutes on medium-low heat. Then, it’s time to finish them. 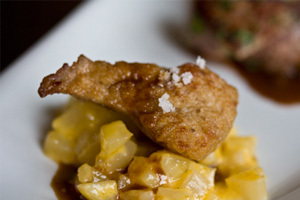 Check out these veal sweetbread recipes for ideas and inspiration.